Welcome to the month of June! It’s hard to imagine summer is nearly upon us after four days of persisting rain – we’ve had more in one day in Paris than we would have in a month! Roland Garros tennis matches have been postponed (the first time in 16 years), and today it took us forever in traffic on a normally fast school run with some flooded roads closed; add some trains striking and it’s all quite chaotic. The good news is it’s all short term: I hear the rain stops on Friday, just in time for a deliciously fun chocolate and pastry walk in Paris to kick off the weekend! 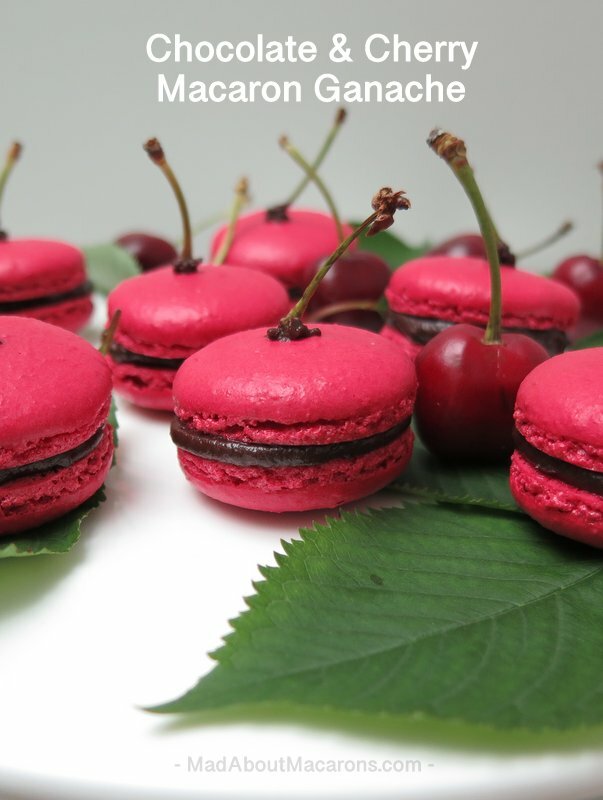 My lovely friends at La Cuisine Paris cookery school had a great idea to cheer us up: with the first of the juicy cherries arriving in the farmers’ markets around Paris, we shared this batch of bright cherry macarons with their newsletter subscribers. Their newsletter is impressive; it’s packed with all sorts of What’s On in Paris, a cheese of the month, and many more delicious features. I’ve only just started out with my own monthly newsletter and although still at the teething stage, will try to get mine out soon! I can hear the rain pelting on the windows again but no rain can dampen our spirits with a splash of Kirsch in this wicked dark chocolate cherry ganache! 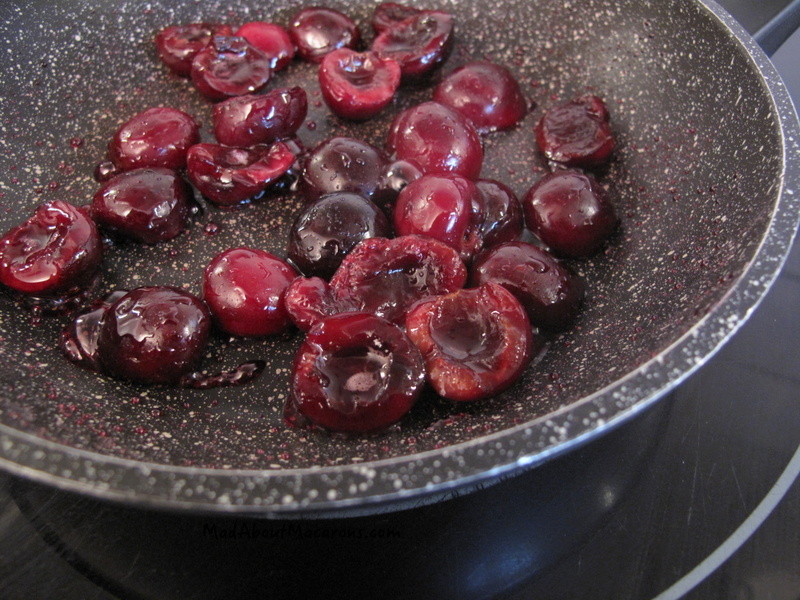 Melt the butter in a non-stick frying pan and sauté the cherries over high heat for 5 minutes. Splash in the Kirsch and leave the cherries to soften over a gentle heat for 10 more minutes. Remove from the heat then blitz to a purée in a food processor. Break the chocolate into pieces in a heatproof bowl and melt together with the cream over a pan of simmering water. Ensure the bowl does not touch the water. Once melted, stir in the cherry purée and add the almond extract. Leave to cool in the fridge for about 30 minutes (be careful not to wait too long as the chocolate hardens quite quickly). 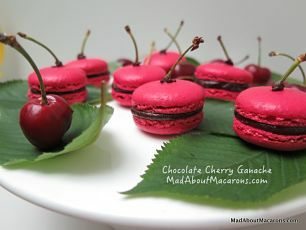 Transfer to a piping bag and pipe the ganache onto your macaron shells. Click on the images on the left to enlarge. 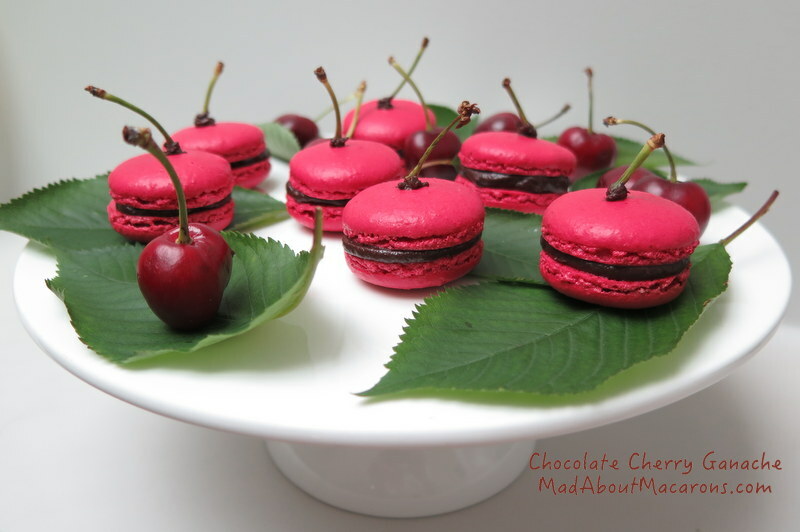 These macarons are delicious with this easy No-Bake Chocolate Cherry Pudding. The macaron shell recipe is in both my books. Hi Jill, This is exactly the filling I’m looking for! Only … it’s Fall and I don’t have fresh cherries. Is there a decent substitute I might find in the store? Thanks so much! It’s not that easy, Catherine, since tinned, jarred in alcohol etc. (even best quality and drained) will be very different but you could give them a try, or even good quality candied cherries. Thanks for popping in! Thanks for the quick answer! I’ll see how it goes! Thanks so much for the recipe! After tasting my way around Paris with pistachio macarons, I love them as much as you do. My favourite at Ladurée as I mention on le blog here on many posts is the vanilla and the orange blossom. My pistachio macaron recipe is in Mad About Macarons, my first book, and I still love making them using this one. Alas, I can’t post the recipe for it here, as my publisher, Waverley Books, prefer that readers buy the book – and at the price of a box of macarons for the book, I understand their sentiment. Sometimes I’ll add some orange blossom to the pistachio filling, inspired by Café Pouchkine. Hi I’m preparing the Orangina Macaron recipe of your Teatime in Paris book – is a Orange drink like a soda fanta. Thanks. 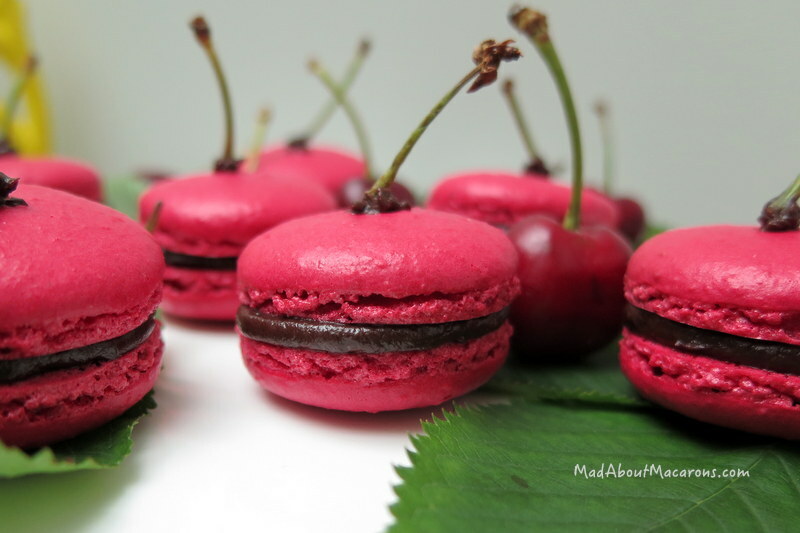 Yes I’m like the recipe thats is a good idea that you open in your blog a only post of diferent macaron fillings and flavors that you will be create, for friends, chefs, for macaron followers and increase the repertory. Thanks, Enrique. It’s not easy, as my publisher prefers that I don’t post macaron recipes – which is understandable, as we’d prefer you buy my books (and they’re certainly not expensive!). Glad you like this! Yes I have the books, for other fillings that it don’t have in the books. Thanks Elly. I’m dying for cherry season again and for some much-needed sunshine! Roll on spring in Paris … Enjoy! Thanks Carol. I think you missed these since I’m only alerting readers to new posts MONTHLY via the new newsletter. Perhaps this is a mistake!? Jill – these have to be the cutest macarons ever! I love how you use the cherry stems. Thanks David. I’m lazy – they’re the quickest decor, sticking them on with a tiny bit of ganache! These look very cute and I am sure they taste delicious!! I always enjoy your photos on IG.. and your photos make want to make macarons and other goodies:) I am “macarongirl61” on IG. Oh my! Great to put your real name to Macarongirl61, Kyoko. Thanks so much for popping by via Instagram. Hehe, Liz. Thanks – just works of a mad macaron person. I do hope you make them soon! So sorry for the deluge, Jill! Sounds like we should exchange weather for a while! We need rain so badly! What is happening with this planet? Remember that Monday you had in Paris? Well it has been like that for too long now. And I can hear it has started up again tonight. It’s crazy!